This round of football is the Sir Doug Nicholls Indigenous Round, named after an incredible Yorta Yorta man who played for Fitzroy in the 30s, finishing third in the Brownlow in 1934. In many ways, football was the least of his achievements. 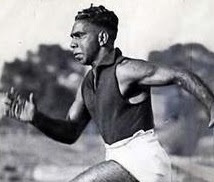 He was an athlete, a Pastor of his church, an early campaigner for reconciliation, active in the Fitzroy community (and other places he lived) and eventually went on to be the first Aboriginal man to hold a vice-regal office when he became Governor of South Australia. He and his wife Lady Gladys also had six children. Fitzroy will proudly host Sir Doug’s daughter, Aunty Pam Pedersen, at a pre-game lunch later in the year. She will speak about her parents and her father’s playing days with Fitzroy. If you want to know more, here is the AFL’s video about Sir Doug’s life, featuring several members of his family. To mark Indigenous Round, Fitzroy Junior Football Club will hold its annual Friday night games at Victoria Park with a special event featuring a Welcome to Country and smoking ceremony. It’s a great event so get on down to Vic Park tonight at 7pm if you can. 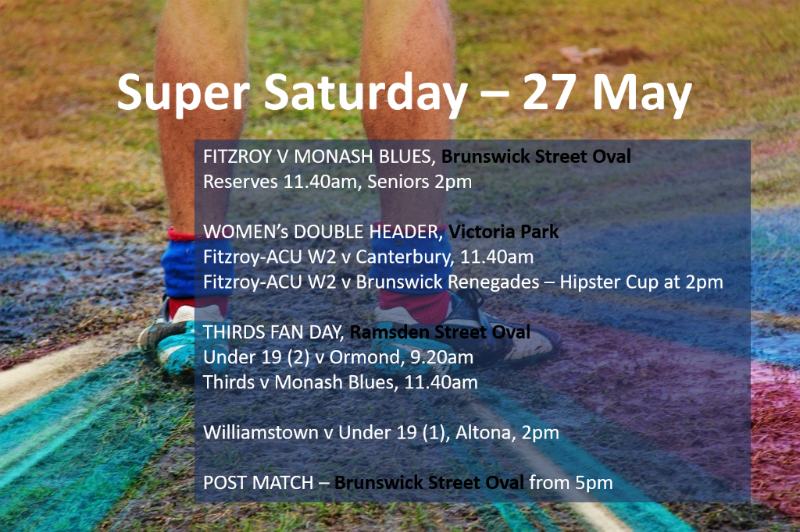 Fitzroy is hosting three home venues this Saturday, with the Seniors and Reserves welcoming Monash Blues, whilst the Fitzroy-ACU teams play a double header at Victoria Park and the Thirds Fan Day lights up Ramsden Street. As part of his report for the VAFA, he wrote “The Roys were looking to consolidate their top four spot, while Mazenod had won two of their past three and were keen to build on that. Fitzroy established a ten-point lead at halftime, but five goals to one in the third gave the Nodders a 14-point advantage going into the last quarter. “Neither side found the goals successfully in the first ten minutes, with Rees Thomas and Nino Lazzaro missing chances for their respective sides. Shaun Lovell marked a Fitzroy kicked across goal and dobbed one from the boundary, then coach Ben Phibbs accepted an errant handball from a Roys defender and nailed another one. Mitchell McWhinney marked inside 50 after a pass from Jack Dalton and kicked the Roys first for the quarter, then a few minutes later Cailean Moore added another one for the visitors, as they crept within a couple of goals. In his summary of the game in The Footy Almanac, King George III, lamented the fluctuation in performance from one game to the next but urged the Roys to get back on the horse this weekend. It was a game Fitzroy would have expected to have a very good chance of winning and now they need to beat Monash Blues to keep in touch with the top four. Expect a hot contest and of course the BBQ will be fired up to make sure you have plenty to eat in between quarters. The Reserves went down by just two points against Mazenod last week and desperately need a win to lift themselves out of the bottom two. The Women’s double header at Victoria Park on Saturday features the Hipster Cup against the Brunswick Renegades at 2pm. This is venue where the local rivals first played for the Cup and Fitzroy-ACU Women 1 will be very keen to keep their iron grip on it. This is one half of a Fitzroy-ACU double header, with the Women 2 team, fresh from a win, taking on Canterbury at 11.40am. Details of the Thirds Fan Day at Ramsden Street are below. Our Under 19(2) team will warm up the crowd at Ramsden Street when they take on Ormond at 9.20am, while Under 19(1) are the only Fitzroy team playing away this weekend, as they head to Altona to take on Williamstown CYMS. Choose which of the home grounds and games appeals but make sure you head back to Brunswick Street for the after-match function and drinks. 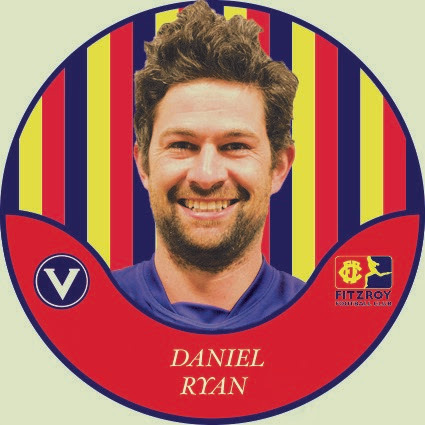 Daniel joined the Fitzroy Football Club in 1993, initially struggling to get a game in the senior team due to his light frame and being eight years old. Despite the club’s youth policy at the time, he would have to wait until 1994 to make his debut. It didn’t take long until he cemented his spot in the team and the nickname, “D-Rock”. After impressing in the back pocket all of 1997, the offers soon came in from rival clubs. It has been said that Monash sent him an 8 year, 7 figure proposal which Daniel laughed at the sight of. After pouring his beer out all over the contract, he muttered something about staying loyal and went back to watching the cricket. The highlight of D-Rock’s career was playing in the 2012 Premier C Thirds premiership. This is also where he earned the nickname D-Rock. Given the role of an enforcer on the ground, Daniel spent the week watching highlight packages of his hero Dwayne ‘The Rock’ Johnstone. Channelling his inner wrestler and using the move “The Rock Bottom”, Daniel hospitalised 12 St Kevin’s players, and guided the Roys to victory! This Saturday marks the 200th game of this Club Legend; a ripper team mate, an inspirational coach and the best damn back pocket the Fitzroy has ever seen. Come help celebrate and watch D-Rock rip through the banner like he has ripped through the opposition for the last 199 games at the Fitzroy Thirds Fan Day. Fitzroy Thirds Fan Day kicks off at 11:00 at Ramsden St Oval, Clifton Hill this Saturday 27 May. Food and entertainment are on offer, including the famous “Keith’s Marvellous Kicking Competition” event. Congratulations also to the Thirds for an outstanding series of old school player bios, which have been appearing on Facebook all week. Check them out if you haven’t seen them. * Fitzroy FC cannot verify the 'facts' of this profile, but wishes D-Rock all the best in his 200th game tomorrow - an incredible feat at any level of football. Two wins for our Fitzroy-ACU Women’s teams last weekend provided the perfect set up for this Saturday’s double header at Victoria Park. Fitzroy-ACU Women 2 broke through for a win over Bulleen Templestowe on the weekend and coach Jo Hogan praised the persistence of her team. Fitzroy took the points 6.16.52 to 1.2.8. The team had a narrow victory in the first of the grading rounds, but had struggled to hit the scoreboard since the season proper started. Jo said the win demonstrated the team’s improvement in ball movement, through transition football and the linking long kick. “They backed each other in, supported each other around the contest and showed unified team belief in each other. There was a good spread of five goal kickers with Bridie Murphy leading the charge with two goals. Maddey Symons won best on ground for a consistent four quarters of intelligent and precise football. Jo encouraged her team to take confidence from the win, noting that it is only percentage separating fourth and sixth on the Women’s Development Division 4 ladder, and to work on increasing their voice on field. Get loud! Meanwhile in the early game on Sunday morning at Sportscover Arena, Fitzroy-ACU Women 1 continued their winning ways when they kept Melbourne University goalless, scoring a resounding win 7.10.52 to 0.1.1. Fitzroy-ACU sits in second position on percentage, with first to fifth teams all on equal points. Coach Mick Symons was very happy with the consistent four quarter performance. Alice Batterton, Gemma Minuz, Greta Robenstone and Erin Gogerly were the best players with Lauren Carlin kicking two goals. Lloyd Browne has been Fitzroy’s official umpire for over 23 years. Not bad for someone who reckons he was dragooned into umpiring after he finished playing because no one else wanted to do it. “That reluctance meant that in my first season, I was only doing home games,” says Lloyd. “Since then, I've been pretty consistent and umpired nearly every week. From 1994 to 2009, Lloyd umpired only Fitzroy Reserves games. 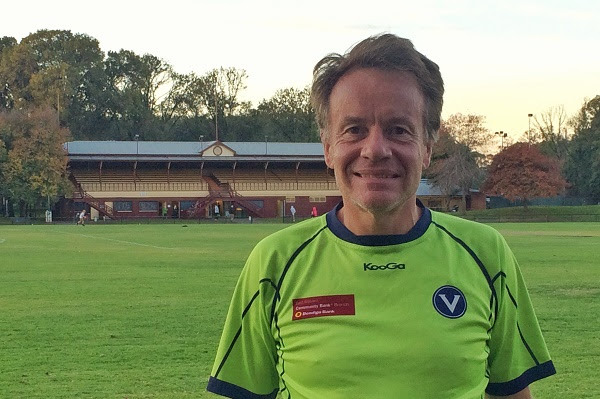 Since the club's elevation to Premier C and subsequently B, he’s been included in an umpiring pool, officiating everything from C Thirds to A Reserves. As an umpire Lloyd aims to be as invisible as possible and, he says, “to bring order from chaos, stop the little blokes from getting injured, and apply the rules without annoying too many players”. Having been with the club for so long, Lloyd is a good person to judge what’s good about it, what his fellow umpires think about it, and how it’s changed over the years. “My fondest memories are turning up at Brunswick Street on a beautiful Melbourne autumn day to participate in the greatest game on earth,” he says, “and then spending four quarters being sledged by Sam Buckley! “In the early 90s, the club struggled to field a reserves team, and volunteers were those who'd already played four quarters and were given the flags to wave in the seniors,” says Lloyd. Without Lloyd Brown’s willingness to act as Fitzroy’s official umpire, something he’s done for over 23 years, we wouldn’t be able to field a team. It’s been a bumpy start for our latest Under 19s team and coach, but this provides fertile ground for Greg Coleman to teach his new charges how to respond to challenges. His own young footy experience is one tale of adversity he draws on; there’s nothing like being big enough to admit your own mistakes. Greg had a promising junior career which he gave up prematurely because of negative coaching and says the regret around his young decision was a real driver in returning to coach football. “I’d had a good playing year, making inter-league, but just as footy doors were opening, I tossed it in due to a bad relationship with a berating coach. “I couldn’t be convinced to play again next season – not by other club officials, nor mates. I kick myself now because I let one person stand in the way of the game I loved. It’s a huge regret – made worse by watching my friends win the flag the next year! 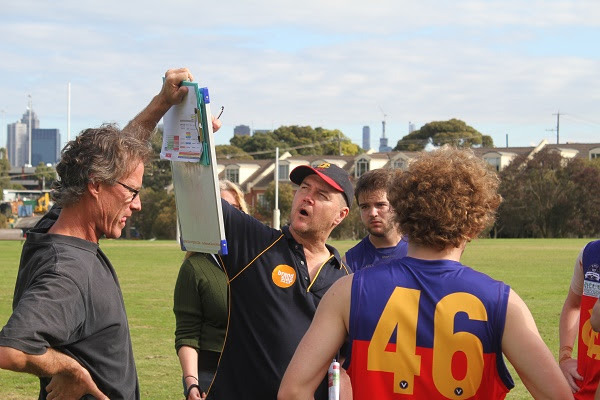 Having retired from his Fitzroy Junior coaching – successful persuaded by Michael Pickering to take on the Under 19 (2) role – Greg is very conscious that part of his gig is creating the pathway from the Colts to seniors. Given he coached Nino (Needles) Lazzaro - best and fairest in his Colts Division 2 team two years ago – his past work in the juniors is certainly paying dividends for the senior team right now. He says the team bonding and the relationship between the two Under 19 teams (the other coached by Tim Bell) is great. Greg started his involvement with Fitzroy Juniors at Auskick when his son Daniel started playing, first as a dad on the sidelines, then match day roles and running, eventually stepping into coaching at the Under 13 level. He coached for five years with the Juniors, including two years at the Colts level. He said it is a proud achievement that his teams went up a division every year for the first four years he was coaching. In terms of creating closer links between the Fitzroy Senior and Junior clubs, Greg also says what he loves is seeing young men going back to help the juniors and cites the example of Monty Stuart as a definite role model. Some of his young Colts players from last year would also return the favour by running water for the Seniors. In terms of his connections with the Fitzroy Football Club, Greg is also the father of Remy Coleman, Fitzroy-ACU’s inaugural winner of the Elaine Findlay Perpetual Trophy as the best and fairest in Fitzroy’s first women’s team. Remy is now studying in Townsville, where she took her love of footy to help the local uni team win the flag last year. “Rem misses the Roys, and her old team mates. But is loving seeing what they are achieving in the Women’s Premier so far this year”. All Fitzroy players, friends and supporters are invited to come along to The Royal Derby next Saturday night with your best mate and stay close - in fact tied by the leg. Embrace the three-legged theme, dress up and win the prize for the duo which stays tied together the longest. 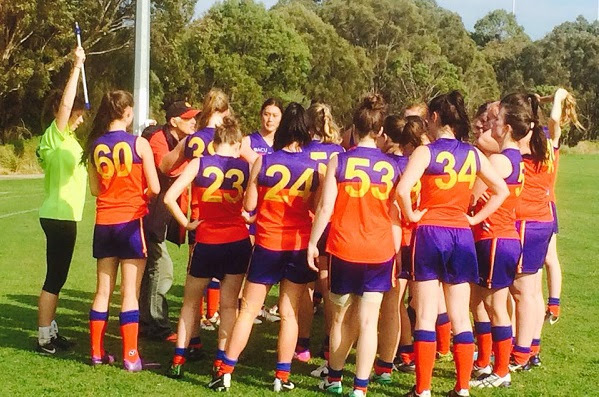 There will be penalties for the Fitzroy team mates who drop out first and lose their partner. The night trips off at 8pm on Saturday 3 June at The Royal Derby Hotel on the corner at 446 Brunswick Street. Fitzroy’s events calendar has been updated on the website – expect to see details of some great events coming up, but in the meantime if you want to know what’s going on, follow this link and click across the months to see what’s coming up.